On a hillside, overlooking the Pacific Ocean and surrounded by virgin palms, Casa Colina is a unique home in a private setting with breathtaking views of both the ocean and the jungle. If you are a nature lover, you will consider this unique home to be your piece of paradise. It provides outdoor palapa living, where you can relax and sunbathe on the large wrap around terrace while watching the migrating Humpback whales, schools of leaping Mantas, diving Pelicans, colorful flocks of Parakeets, Redheaded Woodpeckers, soaring Hawks and numerous other tropical birds. In addition to wildlife watching, without even leaving the terrace, you can view the colorful fishing and luxury sailboats that ride the swells of the bay. This home is a perfect setting for a couple looking for a very private location, as well as the place for 2 couples choosing to vacation together, as the house features two separate bedroom suites with queen size beds and private baths, both featuring unique open tropic showers, enhancing your experience in this beautiful setting, by allowing you to bathe in utmost privacy while feeling you are part of the surrounding tropical environment. In addition, the house has 2 separate outdoor patios. On the side patio, you can position your lounge chair to take advantage of the jungle and ocean views. On the front patio, you will enjoy the rhythmic sounds of the ocean, while watching the surf break on the shore and rocks below. If you have a more active vacation in mind, the white sand beach, located just below the house, offers swimming, snorkeling, fishing, sea kyaking, and surfing. If you are a golfer, you can access the Los Muertas Golf Club by taking a 10-minute walk towards the village. Numerous excursions are also offered by tour companies located in the San Pancho pueblo, which can be accessed by walking 10-15 minutes into the village. If tennis is your sport, you can play on a private clay court, available, by reservation only, by taking a short walk into the jungle. In the friendly and often lively Mexican fishing village of San Pancho, you can try out your Spanish and visit the numerous restaurants serving delicious local dishes and fresh seafood. A great Saturday night activity is walking to the polo field in the village of San Pancho to watch a polo match. There is also a restaurant next to the polo field where you can have dinner and drinks while watching the match from your table. Keywords: Spectacular panoramic views A 15 minute walk into the village of San Pancho. Beach access directly in front of the property. Definitely THE PLACE for tropical bird and whale watching. My favorite spot is in the hammock on the front patio of Casa Colina. Great place to watch the changing of the light as the sun moves across the sky, the flight and chase of the beautiful tropical birds, as well as the spouting of the Humpback whales as they do their yearly migration from the northern waters of Alaska to the Bay of Banderas. Also my favorite spot for reading a good book or just taking a mid day nap. We never intended to buy property in Mexico. We were just on an extended trip through Mexico in our new RV. Once we discovered the beauty of the tropical paradise called 'San Pancho, we were hooked! The RV trip we had planned through Mexico and up the eastern coast of the USA, came to an abrupt end in San Pancho! That was about 18 years ago. We did eventually take an extended trip through Mexico, in addition to exploring the East Coast of the U.S. but the tropical beauty along with welcoming people of San Pancho continues to draw us back to our favorite place, San Pancho, year after year! The beauty of San Pancho inspired my husband to design our beautiful and unique home, Casa Colina. After spending numerous hours on our hill, recording the direction and times of the changing breezes, he designed 6 foot glass doors, strategically placed to take full advantage of the tropical breezes. 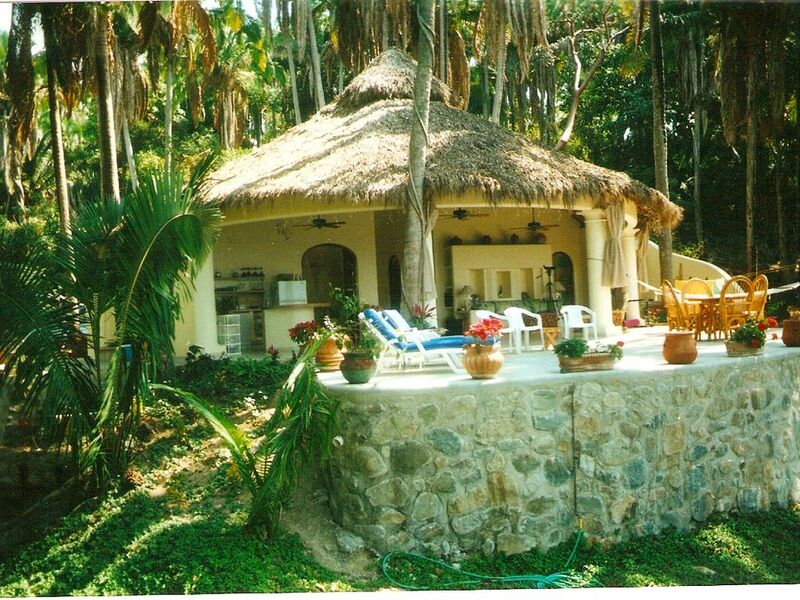 As another way of augmenting the flow of the air, he designed the palapa roof, made of Royal Palm fronds and natural wood, that shelters the front half of the house, in addition to the coupala that sits at the peak of the roof. He then added three ceiling fans to the palapa roof in addition to hanging one in each bedroom. All his careful planning and design gives us a home that is very comfortable without the need for any air conditioning until well into the summer months. At that time, we head for the much cooler summers of the NW. I am also a music lover and my husband's additional thoughtfulness resulted in built in speakers in the front of the house, giving us the amazing effect of beautiful surround sound! Since we discovered San Pancho and built Casa Colina, many others have continued to be drawn to this pristine paradise but we have been lucky enough to have lots of land and space between our home and our closest neighbors. We not only continue to have the kind of privacy we had when we initially built Casa Colina but both our ocean and jungle views have and will remain unobstructed. The increased population of San Pancho has brought more varied and excellent restaurants, a golf course that is open to the public, a polo field hosting Friday evening polo matches, festivals throughout the year with one of the annual highlights being the February music festival! As more visitors from all over the world have continued to discover San Pancho, our local hospital has also enlarged and upgraded it's facilities. No matter where you are in San Pancho, the hospital is approximately 10 minutes away!!! Both bathrooms have tropical open air showers. You feel as though you are showering outdoors but have the privacy of an inside shower. This provides a very special bathing experience, especially at night when there is a clear star filled sky. We have both a beach view and a jungle view. One of the best seats for watching the migrating Humpback Whales is right in our front room and patio. You will also have one of the best views for tropical bird watching, leaping dolphins, schools of fish, etc. One of the numerous Public accesses to the San Pancho beach is just a short walk down our hill and lined up directly with our house. large new electric washer. We do ask, however, that our housekeeper be the only person to use it unless you have an emergency. large, gas and new. See info. regarding the use of the washer. The same information applies to the drier. You can dine on the front or back deck as they both have tables and chairs set up for that purpose, or you can dine in the front room or at the kitchen counter. Numerous sets of placemats available. numerous excursions by boat are available nearby. The Kitchen is equipped with microwave, range, full size refrigerator, cookware and utensils, Everything you will need for your dining pleasure. You can reduce your packing of clothing as the maid will do your laundry for you, All linens, including beach towels are provided, and there is complete maid service twice weekly, No Pets or Smokers please. The house is handicap accessible with some exceptions. Sea kyaking, surfing, surf lessons, horse back riding, yoga, massage, manicure, pedicure, or just relaxing in a very quiet private setting. The San Pancho activity center now offers Spanish lessons, guided trips to an orchid farm and hot house, in addition to other community activities. Just be sure to frequently check their schedule by stopping by the center.